Thanks so much for helping me fix my broken start menu and task bar [which required a complete reinstall of Windows 10 32-bit] using your remote desktop support service. After you reviewed my laptop's hardware, I am taking your advice and wish to upgrade my system to 8GB of RAM. I understand that once I upgrade to the 8 GB of RAM, I will also need to upgrade to Windows 10 64-bit, because Windows 10 32-bit can only see a maximum of 4GB on my system. My question is: how can I upgrade from Windows 10 32-bit to Windows 10 64-bit? I downloaded Windows 10 64-bit using the Media Creation Tool and ran the setup.exe file, but it told me that 'This app can't run on your PC'. So, how can I do the upgrade? " Since Frank's computer was still connected to my server using the remote desktop support software, I re-connected to his machine to have a look at the issue. In previous 'all-in-one' editions of Windows 7 and 8, it was possible to launch the setup.exe from the Windows install media and do an upgrade from Windows 7 or 8 32-bit to Windows 7 or 8 64-bit - right from the desktop. However, in doing so, this would create a brand new Windows installation and rename the previous Windows directory to Windows.old. That is completely normal behavior, because there is no upgrade path from 32-bit Windows to 64-bit Windows; that is partly because 32-bit Windows can run 16-bit applications, and 16-bit applications cannot run on 64-bit Windows. Instead, you would need to reinstall all your programs and re-import all user data, etc. With Windows 10 (and 8), we have the Media Creation Tool which allows us to download Windows 10 64-bit or Windows 10 32-bit as an .ISO file (disc image), or we can burn it straight to DVD or write to a USB thumb drive. Whenever I'm doing a Windows 10 install, I prefer to download the .ISO file to the hard drive, then use WinCDemu to mount the .ISO file as a virtual DVD drive, then run the setup.exe from the virtual drive (via My Computer / This PC). In doing so, I don't have to burn a disc, plus it runs a lot faster because it's reading the data directly from the hard drive. With that said: if you run the setup.exe on the Windows 10 64-bit media from a Windows 10 32-bit desktop environment, you will receive the error "This app can't run on your PC" (pic). In other words, Microsoft isn't allowing us to make the leap from Windows 10 32-bit to Windows 10 64-bit directly from the desktop as per previous 'all-in-one' editions of Windows - here's wishing they would get their act together and make the process a little more simpler. Note that the 'all-in-one' editions are special .ISO images of Windows created by system administrators and typically used on corporate environments, though it is possible to roll your own 'all-in-one' edition of Windows using a specialized tool like WinAIO maker, which I believe is free. Download and install the Microsoft Media Creation Tool for Windows 10. This tool allows you to download Windows 10 32-bit or 64-bit (or both) from Microsoft for free. Use the Media Creation Tool to download Windows 10 64-bit and burn the image to DVD or write it to USB. Note: based on my experience, the Media Creation Tool may not run on some systems - it will either spin its wheels indefinitely and not progress, or it simply won't launch at all. In that case, you can try using the Media Creation Tool on another PC, or download the Windows 10 "Tech Bench" version of Windows which downloads as an .ISO file. Read this article for full details. Backup your entire system using a disk image, preferably onto an external hard drive. THIS STEP IS CRITICAL. I have personally witnessed Windows 10 setup.exe nuke an entire user folder (C:\users\username), wiping out 500GB of data - you have been warned! If you don't know how to make a proper disk image, I can do it for you - simply contact me briefly describing your issue and I will get back to you as soon as possible - also please reference this article. Once the media has been created, reboot the system. The Windows 10 media should boot at this point. Note: if your Windows 10 DVD / USB does not boot, then you may need to adjust your BIOS boot sequence so that the DVD / USB drive boots before the hard drive, otherwise your system will just continue to boot straight into your existing Windows desktop. Since everyone's BIOS is different, there are only generalized steps on how to change the boot sequence. Also note that some computer's won't boot from USB; in that case it may be a better option to create a DVD instead, if you have a DVD drive attached to the system. After the Windows 10 64-bit install media boots, click the "Install now" button (pic). IMPORTANT: on the proceeding page(s), you will have an option to choose a "custom" Windows installation (pic) - this is the second option on the list. 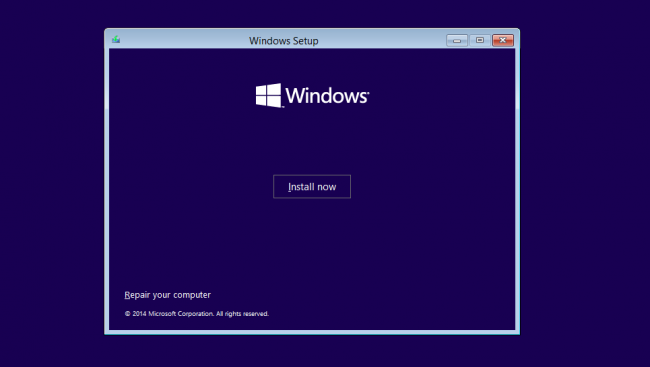 This will rename your existing Windows installation to Windows.old, then install the new Windows 64-bit to C:\Windows. Make your way through the installation until you get to the desktop. Once you reach the desktop, begin re-importing your user data from the backup. Note: you will likely need to change permissions on the user data you're re-importing via an administrative command line using the takeown and icacls commands, or the data will not be writeable - which means you won't be able to edit documents, rename files, etc. This will need to be done recursively so all subfolders will be included. IMPORTANT: if you don't use the Windows command line often and if you use the takeown and icacls commands incorrectly, you could potentially hose existing file permissions on system files, thereby corrupting your Windows installation. THIS WOULD BE CATASTROPHIC and completely irreversible. Since everyone's restoration is different, it is beyond the scope of this article to explain this step in detail. As such, you are welcome to contact me for support and I can do it for you - described further down. Once that is done you can begin reinstalling your programs. It is highly recommended you download all the programs you wish to install from the Internet, and make sure you grab the 64-bit versions - rather than reinstalling old versions already stored on your hard drive. There are two reasons for this: first, most programs will have been updated specifically for Windows 10. And secondly, it is better to have 64-bit versions of the program you're reinstalling versus 32-bit, as it will run faster (depending on the type of program you're using). If all of this is over your head and you need help upgrading from Windows 10 32-bit to Windows 10 64-bit, I can help. Simply contact me briefly describing your problem, and I will get back to you as soon as possible. Nice article. There is at least one exception to your advice about installing 64-bit versions of your existing programs: Microsoft Office. There appear to be some circumstances where you should stick with the 32-bit version of Office even in a 64-bit version of Windows. I can't quite figure it all out -- so here are two key links. Perhaps Dennis, you could explain it all in plain English someday. For most folks 64 bit Office would be fine, but if there very specific requirements needed, then 32-bit will be needed. Read the FAQs if in doubt (the link you provided is a good resource). You overlooked one detail: One must be running a 64bit CPU to start with.